Uglyworld #203 - Lunch near the Nurburgring, originally uploaded by www.bazpics.com. On the drive back from Freiburg today Wage noticed the signposts for Hockenheimring and the Nurburgring and got all excited as he thought we were going to visit one of them so that he could race around the track. He was so disappointed when he discovered we had only planned to drive directly back to Aachen that he started sulking. I decided that I had better do something to cheer him up, so I pulled into a Burger King near Adenau (village close to the Nurburgring) and asked Wage and Ice-Bat what they wanted to eat. Wage was amazed to see Lamborghini's and Porsche's in the carpark and wandered off muttering, "No food for me, I want to check out these awesome cars". Myself and Ice-Bat went inside and decided on a Big King XXL. 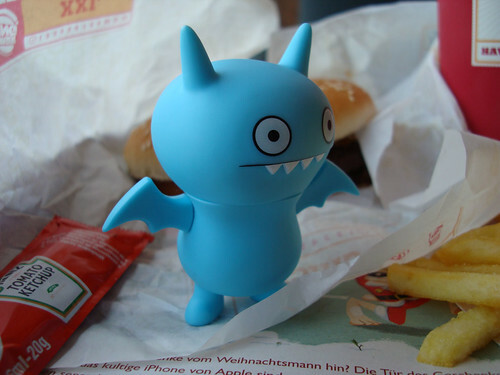 There was so much food to eat that Ice-Bat didn't know where to start, so after a couple of minutes deciding he tucked into the french fries first!